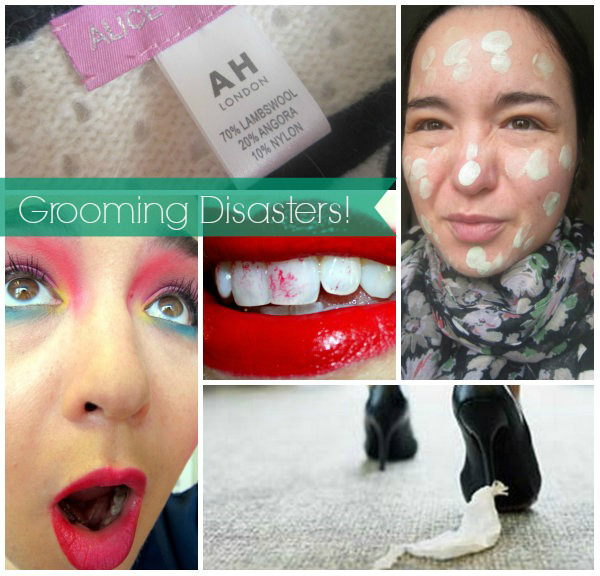 Fashion and Beauty Disasters - What's The Worst That's Happened To YOU?! You know those really chic, elegant women? The ones who look like they don’t even have to try? All graceful limbs, coiffed hair and perfectly applied, minimal makeup? Yeah, I’m so not one of those women. I like to think my style is, er, artfully dishevelled (I'm rabbiting on about my personal style here), but more often than not it’s just plain old messy. You’re more likely to find me tripping over my own handbag, wiping toothpaste off my face at the bus stop or with bright red lipstick on my teeth. It’s been pointed out to me at work that my jacket – and on one memorable occasion, my dress –is back to front, and I’ve looked down in a meeting to spot one black and one red shoe. Yes, on my own feet. Around 29% of women said they had laddered their tights before, which actually struck me as bizarrely low – 70% of us haven’t?! Who are these women and where are they buying their hosiery? 26% of women in the survey had toilet paper stuck to their shoe, 12% had tucked their dress into their underwear, while 14% said that their shoes or heels had broken during a night out. Um, check, check, and check. Just over 2% of women said that they had ripped their outfit, which again seems smaller than I expected. This happened to me just last weekend. Maybe I need to start buying more expensive clothes? Come on, spill – what’s your most embarrassing grooming disaster?! Hee hee, fun post :-) My worst beauty moment was when I tried to wax my own upper lip with hot wax. I ended up the emergency room... and looked like an idiot for a few weeks. Can't really think of any... maybe the worst was when a heel of a new pair of shoes broke off. I immediately headed (limped) to the shop to buy new ones. This is such a cute post...I am always sadly spilling coffee n my clothes, I don't why but it keeps on happening. Ha I think my first ever fake tan trial was my most epic fail, streaks galore! the first time i plucked my eyebrows i plucked them bald. going out with tags still attached to dresses (invariably seems to happen at important chic and classy functions for some sods-law based reason). "artfully disheveled" I love it! No major disasters for me - heel came off a boot one time, and mostly just buttons popping off and lipstick on my teeth! High heels breaking - isn't it wonderful when that happens? -.- And seriously, only 29% on the tights? Who are they and where do they buy their hosiery indeed! That is bizarrely low... maybe they mean a full on ripped up to the crotch ladder. The toilet paper on the shoe one is THE WORST. This was exhilarating and comforting my dear!! Of course all of us desperately strive to be cool and chic at any time but that is impossible. Well, I ripped my clothes a zillion of times, while getting dressed in a hurry because I couldn't pick a match in my closet. I managed to reep a real leather jacket by stumbling into some hook. Broken heels? I recall at least three times. Tomato sauce on my outfit, the other night. And I can't even say it's due to my little daughter, because I am the messier one!! Lots if love darling, I so much enjoyed this post! Umm lets see, attempting to dye my dyed red hair a darker shade of red in the hope that it wouldn't fade as fast and ending up with pink & purple hair. Breaking a heel on my favourite boots while walking to meet my then bf and having to hobble down O'Connell street in limerick like someone with a gimpy leg. Laddering tights all the time. The only and only time I got a spray tan, I looked like what my friend called a biafric and my husband and best friend have never laughed so much. I have ripped my outfit on more than one occasion. Oh and once when I pulling into the parking lot at work almost a 90 minute drive from my office I spilled an entire large (very hot) cup of coffee down the front of my pants. Yep, not pretty. i;ve too many to count at this stage; but one that sticks out is going to the loo in the pub and walking back with my zip undone. My jeans were too tight to wear pants so everyone saw my lady garden! Morto for my ma for having me!